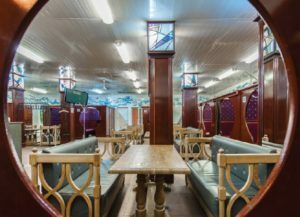 Muscovites have loved to wash and take steam baths in city banyas for a very long time, and nothing could ever stop them – not mass construction projects, and not the widespread emergence of personal bathrooms in people’s homes. Almost every district in Moscow had its own banyas. Even back in the beginning of the 19th century, the city already had 1,500 private and 70 state banyas. Capital Ideas has put together an overview of Moscow’s historical banyas that you can still visit today. If you haven’t been to Sanduny, you haven’t really been to Moscow. The story of these famous Moscow bathhouses is connected to Sila Sandunov and Elizaveta Uranova – talented actors from Catherine the Great’s court theatre. After marrying the two lovers, the empress gave them diamonds, which Sandunov used to purchase a plot of land in the Neglinnaya River district in Moscow. He later bought his neighbor’s homes and demolished all of the buildings on his land in order to construct residential quarters and shops. But soon, Sila Sandunov changed his mind and decided to use the area to build banyas. They were completed in 1808. Sanduny have always been, currently are, and always will be the best banyas in the capital. In the 19th century, they were a true miracle of architecture and engineering that impressed visitors with its halls, vaulted ceilings, rich stucco molding, paintings, and marble staircases. But even now, in the 21st century, they haven’t become any less magnificent. So they remain the highest standard for Russian banyas. According to writer Vladimir Gilyarovsky, these banyas “have hosted the Moscow of Groboyedov, the Moscow of Pushkin, and the Moscow that gathered in Zinaida Volkonskaya’s salon and in the English club.” Alexander Pushkin himself came to the banyas as well. After the steam room and bath brooms, he liked to take a dip in cold water with bits of ice floating in it. Sanduny became the center of the capital’s public life, combining a club, a clinic, and, of course, the banyas. 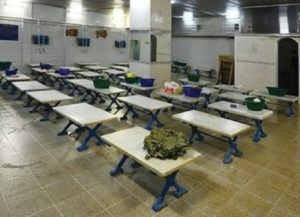 It was Sila Sandunov who first split up the banya into men’s and women’s rooms. Prior to this, everybody washed in the same rooms. There were comfortable rooms with expensive furniture and silver bath accessories for noblemen here. Sanduny met every whim of the wealthy crowd. For example, high society ladies could visit the establishment together with their dogs. The technical infrastructure of the banyas were fantastic for their time. The water was supplied from the Moscow River with a specially constructed water pipe, which stretched from the Church of Christ the Savior to the Prechistenskiye Gates, and from there stretched across Volokhonka, Mokhovaya, and Kuznetsky Most to the reserves of the bathhouses. In Sanduny, the water was purified with American filters, and was completely safe to drink. 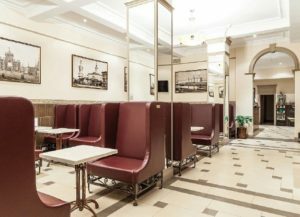 Adherence to strict hygiene rules, electric lighting (a special power station, which was the first largest power station in Moscow, was built for the banyas) – all of these innovations made Sanduny a true palace of cleanliness. Today, Sanduny are an architectural monument of the capital. People have business meetings here, spend time with friends, and come for tours. And most importantly, the place has retained the spirit of a true banya. 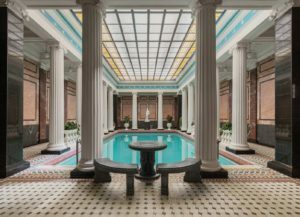 It can definitely be considered Moscow’s first spa center that is over 200 years old. Built for true banya lovers, Sanduny has three sections for men and two sections for women. There are huge leisure rooms, pools, and Russian steam rooms. 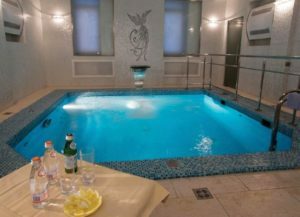 For those who want to spend time away from the crowd, there are separate banyas (8 rooms with original interiors, Russian stoves, and jacuzzi pools). Of course, there is a restaurant in Sanduny as well. After a day at the banya, guests can try Russian , Uzbek, and Chinese dishes. There is a laundry room here, as well as a “Sandunov” stand, where guests can find banya accessories, soap, bath brooms, and souvenirs. For many centuries, the Moscow district of Presnya was famous for its clean water, which was transported by water haulers throughout the city. The water there was chilled, and tasted a bit sweet. It didn’t come from the Moscow River, but from the Students well, which was located near the modern-day International Trade Center on Trekhgorny Val. Until this day, there is a well pavilion built by the famous architect Domenico Dzhilyardi on the nearby Mantulinskaya Street. This well with chilled water is what the whole district of Presnya was named after. The word for chilled (“studyonaya”) can be found in the names of Studentskiye street, park, and square. Moreover, the Presnya River itself, which the whole district is named after and is famous for good water, attracted a lot of swimmers and people going for leisurely strolls. Back in 1806, there were ponds and a garden established for the public near the Presnya River. Right next to them, there were city banyas with water that was supplied from the Presnya River or the Students well. The baths quickly became popular among Muscovites. In the middle of the 19th century, they were purchased by the wealthy Biryukov coachmen. The baths were owned by them until the October Revolution of 1917. The banyas were located in the busiest part of the district, on the corner of Prudovaya and Bolshaya Presnenskaya streets (currently Druzhinnikovskaya 25 and Krasnaya Presnya 7). In 1903, a trendy modern-style one-story building was constructed to house the baths. The facades and interiors of the building resembled a wealthy merchant’s mansion. It was finished with gorgeous stucco molding, forging, and carved doors. At the corner above the main entrance to the horseshoe-shaped niche, there was a ceramic painting called “Swans” by the famous artist Mikhail Vrubel, which became a kind of symbol of the Presnya district. There were two separate banya section: one for the people, and another one for nobility. The baths were maintained by distant relatives of the Biryukovs, along with old believers from the Nizhny Novgorod province. There was also a tea house, library, a billiard room, and a small winter garden. In the 1970s, Krasnaya Presnya underwent reconstruction. The street more than doubled in width, and all the old homes on the odd side were taken down. In 1980, Presnenskiye baths seized to exist at their former location. A Hungarian trade office and cinema center were built in place of the bathhouses. The banyas were moved near Ulitsya 1905 Goda metro station, to Stolyarnoy Pereulok 6. Famous architects V. Ginsburg, A. Taranov, and M. Philipov designed and built a new building for the Krasnopresnenskaya banyas in 1977-1980. It was a separate project, which was extremely rare for Moscow and the USSR in general. 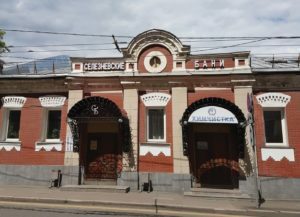 This beautiful three-story building made out of red brick with basement utilities and ancillary facilities was made to resemble early 20th century modern-style architecture, as a kind of tribute to the former Biryukov baths. And as a reminder of the former entrance, the “Swans” picture hangs outside the elegant main entrance. A huge horseshoe-type arch with white stone edging was constructed out of special brick. The modern building was equipped with powerful gas furnaces that heated cast-iron boilerplates to maintain a stable thermal environment in the steam rooms throughout the day. This allowed the baths to serve up to 180 visitors at the same time. This is one of the oldest banyas in Moscow, originally built in 1938. It has recently reopened after major reconstruction. The Varshavsky bath house is located in a large four-story building. The first floor has a restaurant, the second floor is the men’s section, the third is the women’s section, and the fourth has bath houses from all over the world. 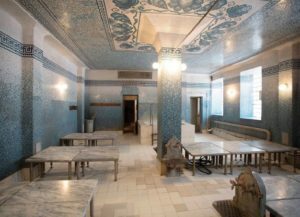 During reconstruction, it was important to preserve everything that fans of traditional Russian steam rooms go to public bath houses for and the spirit of the old Varshavsky bath house, but at the same time upgrade the infrastructure and modernize the design of the complex. The best architects and designers worked on the project. Today, the men’s and women’s sections are impressive in terms of creative execution and high-quality finishing. The “Baths of the World” on the fourth floor serve as VIP rooms. They’re done in Russian, Byzantine, and British styles and are heated with wood stoves. The section for women can accommodate 64 people. The interiors are mostly white. The numerous mirrors create an atmosphere of lightness. Each cabin has a convenient table for drinking tea, and guests are always offered tasty and healthy herbal teas here. These old Moscow bath houses are on the Forbes “14 most interesting banyas in the world” list. Their story begins back in 1888, when 2nd guild merchant, Moscow State Duma deputy, and major banya enthusiast Ivan N. Malyshev decided to build a bath house complex that is now widely known as Rzhevskiye banyas. At the time, Malyshev already owned two public banyas in Moscow. The first one was in the Pegov House on the corner of Neglinnaya Street and Petrovsky Boulevard (now, the building houses the “School of Modern Plays” Theatre), and the second one was located at the corner of Alekseevskaya Street and Krasnoselskaya Street (this building no longer exists). In 1919-1925, the former “Malyshev banyas” were renamed “Krestovskiye banyas.” In 1936, the bath houses were renamed again and were called “Banya Complex No.3 of the Dzerzhinskiy District of the City of Moscow.” According to the “Moscow in New Districts” reference book from 1936, the capacity of these bath houses amounted to 455 people “judging by the number of spots in the changing rooms.” There were three classes of banyas, which served a total of 1,091,200 people in 1935. During WWII, the baths served military formations sent to the front from the Rzhevsky railway station (now Rizhskiy), at which point the bath complex was given a colloquial name due its proximity to the railway station. After the reconstruction of the bath complex in 1947, the name became official. Thanks to the unique atmosphere provided by the arched steam rooms that have not been rebuilt since the bath houses were first established, the steam here has always been special. And thanks to its own boiler room, the bath house can always maintain the perfect temperature in the steam rooms. There is a women’s and men’s section, as well extra comfort cabins. Going to the steam room is like a true ritual here: the steamers stand in the center of the room, scoop up the steam, and envelop people who are lying down in it. Most bath house workers have been here for decades. This is a modern complex of bath services in a historical “Stalin’s empire” atmosphere. Vorontsovskie banyas are some of the oldest and most famous bathhouses in Moscow. There aren’t a lot of establishments that can brag about preserving the true spirit of a public banya. The bath houses here differ from other banyas primarily because of their welcoming atmosphere, and many fans of the banya choose “Vorontsi,” which is the nickname they’ve acquired over time. The story of Vorontsovskie banyas starts in 1938, in the Proletarskiy district of Moscow, which was populated by the working class and packed with wooden barracks. That’s when construction of the building began across from the Novospassky monastery. The civil defense facility, or sanitary-washing station, as the baths were officially called back then, was vital for local residents. State institutions were the only option for people who wanted to take a bath back then. The surrounding factories – “Moskovskiy Shinniy,” “Serp i Molot,” “Dinamo,” and “Perviy Sharikopodshipnikoviy” – provided numerous visitors to the bath house on a regular basis. The weekly trip to the banya, which usually happened on Saturdays, was practically the only accessible form of leisure for working class families, and was therefore cherished. Today, Vorontsovskie banyas are a full-fledged banya complex that features every type of modern day service. Several generations of Soviet citizens have bathed within its walls, and every brick is completely saturated with their happy energy. The total area of the bath house amounts to over 5,000 square meters. It’s split up into 2 men’s sections (the first and upper section), and one women’s section. The upper men’s section stays open 24 hours a day. Each one has a pool and can seat up to 50 people. The improved upper men’s section can seat 45 people. 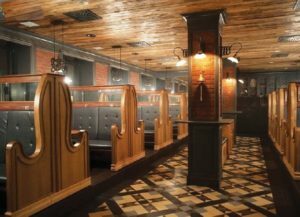 Staying true to its history, the section is done in the style of “Stalin’s empire,” and probably brings joy to a lot of older Russians who want to visit steam rooms that were previously only accessible to the elites of the Communist Party. The Russian Vorontsovskaya banya is famous for its steam room. It has the right kind of furnace which leaves the guests feeling comfortable because the steam room is very easy to breathe in. Seleznyovskiye (Samotetskiye) banyas in Moscow were reconstructed in accordance with architect Popov’s design in 1888. The bath house belonged to a second-guild merchant, Sergey S. Krasheninnikov. Like today, the bath house had two buildings. One of them was for nobility, and the other was for the general public. Each building had men’s and women’s sections. After reconstruction, the buildings became bigger, separate entrances were built, there were new maintenance buildings and stands for selling kvas and sbitene, washrooms existed near the large pond that existed at the time, and the exterior of Seleznyovskiye banyas hasn’t changed much since that time. It’s worth noting that the banyas don’t have a foundation. The buildings sit on oak piles. Krasheninnikov owned the banyas until the October Revolution. The Soviet government opened the banyas to the public. 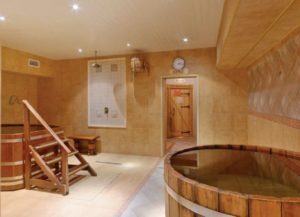 The wooden buildings and pond eventually disappeared, but the famous “Seleznyovskiy steam” is still considered one of the best by banya lovers in Moscow. Plus, the largest plunge tub is also here. Izmailovskiye banyas are an old establishment that was built in 1956. It got an updated look in 2002, when major repairs were made. 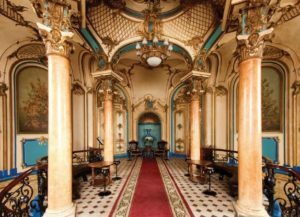 That’s when the gorgeous mosaics appeared on the walls and ceilings, along with intricate wood carvings, which perfectly fit with the pompous Stalinist architecture with columns, huge vestibules and high ceilings. The bath house itself is a small steam room with excellent steam and comfortable benches, a washroom with warm benches made of artificial marble and shower cabins, and a small pool from which people scoop water and pour it over themselves. The dressing room consists of large cabins with log walls, each for 6 people. There is a lounge with tables and ashtrays, a buffet, and a massage room. The Izmailovskiye banyas have been known for their gorgeous interiors and cleanliness for many years. This is exactly why people come here with children, especially since children under 7 can come in free, and children ages 7-12 get a 50% discount. There is a hairdresser, a body philosophy studio, and a solarium. Visitors can also get manicures and pedicures, and visit the spa. There are two big halls that alternate between accepting male and female visitors. They’re also some of the oldest ones in the city, and were built as a counterweight to Sanduny and Krasnopresnenskaya banyas. But when it comes to the interior, it can’t compare to Sanduny or the Krasnopresnenskaya banyas, which have undergone restoration. A long time ago, the Usachevskiye banyas had regular clients, which is why the place developed its own traditions over the course of many years. The bath house has been operating since the 1930s and is not quite popular among city residents. The banya has a capacity of 400 people. There are always people in these baths today, all because the tickets are relatively cheap. But the low price doesn’t impact service quality: the steam rooms are the best in the capital. It’s also important to note that the Usachevskiye banyas has a club of people who are huge fans of steam rooms. Real banya professionals come here, who appreciate steam with chamomile, wormwood, sweet clover, eucalyptus and a whole bunch of other healthy herbs.